Like every working American family, members of Carpenters Local 195 are feeling the pain of a sluggish economy without the added burden of bailing out health insurance profiteers on Wall Street. I have included documents from our healthcare fund and union leaders that tell the story, but first let me explain how our health insurance fund works. Carpenters, Laborers, Ironworkers, Electricians and many others in the building trades often work for multiple employers during the year so we have a rather creative way of funding healthcare for our families. Using the negotiating power of all of our members and retirees (three local carpenters unions), the Heartland Healthcare fund is administered by the Wilson-McShane Corporation. A single carpenter will pay the same premium as a carpenter with six children and a wife. Our plan is a basic 80-20 plan with reasonable deductibles and heart-stopping costs. 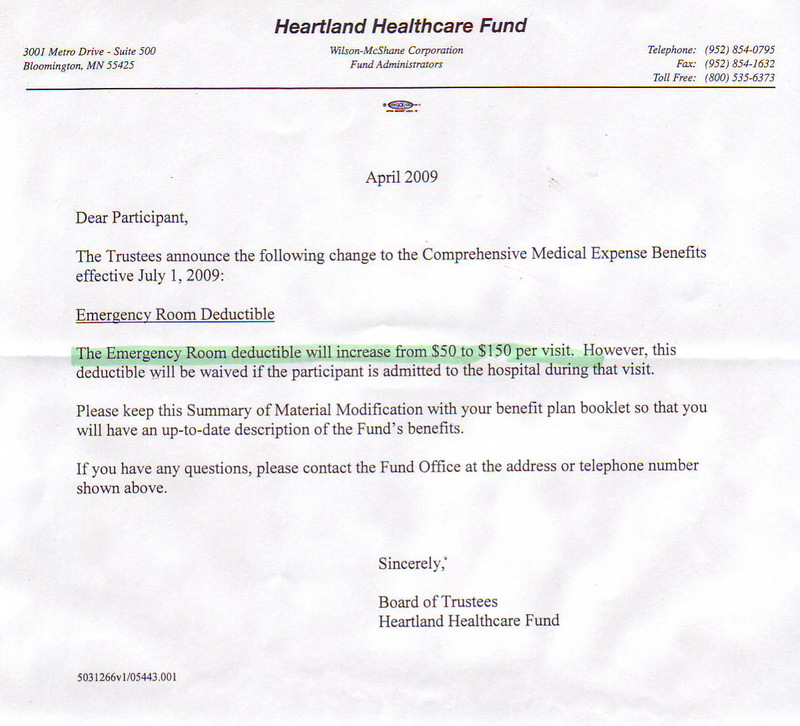 In April 2009, that monthly premium increased from $715/month to $825/month and the emergency room deductible increased from $50/month to $150/month. The next two documents tell this story. To pay these premiums, a portion of our hourly pay is put into a dollar bank that is administered by Wilson-McShane. When the dollar bank goes dry, the carpenter and his family become uninsured. 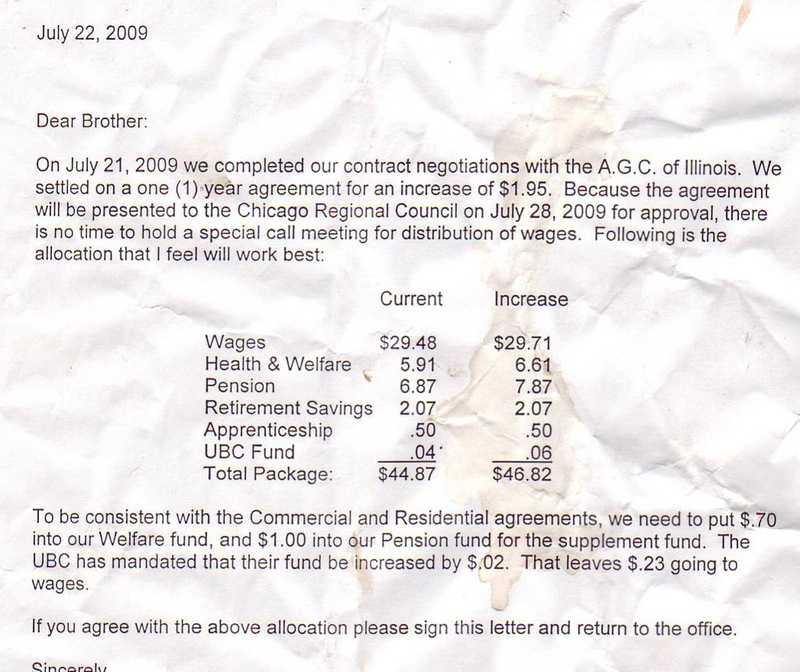 The next document shows that our total hourly wage (pension + health insurance + retirement annuity + union fund + apprenticeship fee + our $29.71 hourly wage) is equal to $46.82/hour. 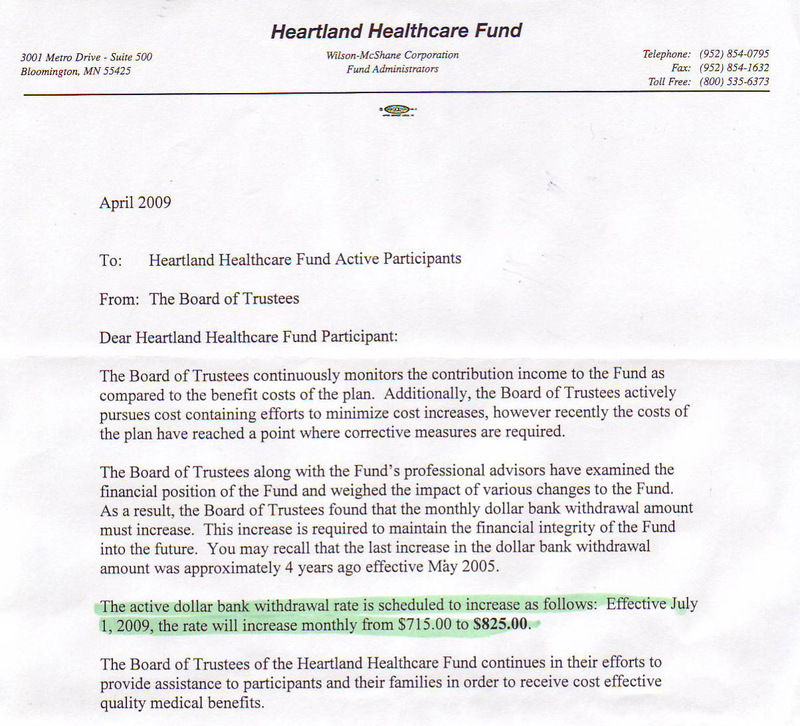 Of that $46.82, $6.61 (14%) is paid into the healthcare hour bank (see document below). The more hours one works, the more the hour bank grows; meaning that the only way to get ahead of the game and add some insurance for the winter months is to work overtime. Single-payer or group plans – which is better? Currently, about 3.5% ($1.04) of our paycheck goes to Medicare and Medicaid while 14% ($6.61) goes to the private insurance industry. So, 17.5% of our current paycheck is going to the healthcare industry; notably, this is almost double the cost of single-payer healthcare, an estimated 9% of hourly wages (not taxing pension benefits). A single-payer national healthcare program that covered 100% of every medically necessary procedure (mental health, dental health, surgeries, emergency room, eye care and even pre-natal care) would cost roughly 9% of our paycheck or $3.44 per hour. Moving to a single-payer healthcare program means an additional $673/month or $6,736/year if a carpenter would work 10 months out of 12 months (a reasonable work year during these tough economic times). It should be noted that a single-payer plan would be available to any U.S. citizen who needed healthcare 12 months out of the year, even if that worker was temporarily out of work. Even if the worker and the business owner split the healthcare savings ($2.10/hour pay raise for the worker and $2.10/hour additional profits for the business worker), it is still a healthy pay raise and I would sleep much better at night knowing that I was not contributing to some CEO’s multi-billion dollar/year corporate welfare scheme. We need a healthcare plan that works for the middle-class and that plan is H.R. 676 (the Federal plan) or House Bill 311 (the Illinois plan). To get involved with the Illinois Single-Payer Movement, please stop by the Healthcare for all Illinois site. This entry was posted on Monday, August 17th, 2009 at 9:51 am	and is filed under The Front Page. You can follow any responses to this entry through the RSS 2.0 feed. You can skip to the end and leave a response. Pinging is currently not allowed. And of course, John, the hit you take is not limited to premiums- co-pays, deductibles, drug costs, vision and dental- all out of pocket. Single payer is an economic recovery act in itself. A reasoned and logical approach will get you no where. Your plan steals from the rich (who stole it from us in the first place) and gives to all the rest of us. How can that possibly work? Forget the fact that you’d be getting much more health care on top of the money, the flaw that I see is your 2.10/hr gain and the companies 2.10/hr gain does not go directly to that insurance company, to be paid to executives and politicians. Snark aside an excellent post, breaks it down in a way that any one who gets a paycheck should be able to understand. Sorry John, I just don’t buy it. I much prefer to have a 22 year old adjuster from Aetna making my healthcare decisions for me. And if I want to continue paying higher premiums and deductibles, that is my consitutional right, amigo. Oh yeah, and keep your government hands off Medicare and Social Security. You got that?